Unruly People shows that in mid-Qing Guangdong banditry occurred mainly in the densely populated core Canton delta where state power was strongest, challenging the conventional wisdom that banditry was most prevalent in peripheral areas. Through extensive archival research, Antony reveals that this is because the local working poor had no other options to ensure their livelihood. In 1780 the Qing government enacted the first of a series of special laws to deal specifically with Guangdong bandits who plundered on land and water. The new law was prompted by what officials described as a spiraling "bandit miasma" in the province that had been simmering for decades. 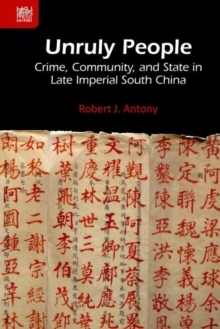 To understand the need for the special laws, Unruly People takes a closer look at the complex relationships and interconnections between bandits, sworn brotherhoods, local communities, and the Qing state in Guangdong from 1760 to 1845. Antony treats collective crime as a symptom of the dysfunction in local society and breakdown of the imperial legal system. He analyzes over 2,300 criminal cases found in palace and routine memorials in the Qing archives, as well as extant Chinese literary and foreign sources and fieldwork in rural Guangdong, to recreate vivid details of late imperial China's underworld of crime and violence.